Unhappy with the Way Your Teeth Look? If you are unhappy with the way your teeth look, Dr. Wu and his team want to hear from you. We offer a conservative way for you to improve the look of your teeth when they are stained, chipped, or even crooked. Cosmetic bonding is an affordable and comfortable way to enhance your smile and improve the appearance of a tooth without having to remove the tooth or undergo an invasive procedure. The procedure is completed in just one visit to our office in which a tooth-colored composite resin is placed onto the tooth. The bonding material is color-matched to your teeth, so that it will not stand out. In addition to aesthetic corrections to your teeth, the bond resin is able to be used to repair your tooth as well and is used in place of amalgam fillings. This type of a filling does take more time to complete, but it looks much better than the traditional silver in the tooth. 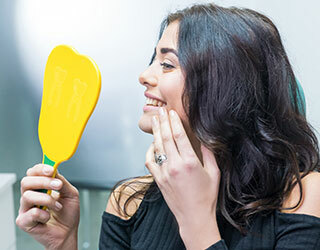 If you are interested in bonding for your tooth or teeth, now is the time to schedule an appointment with Dr. Wu and his team to go over your options. Call us at (650) 571-6666 for our San Mateo office or at (650) 718-5086 for our Mountain View office.